During our recent trip to London, I had the opportunity to roam around by myself and simply take photos. Forget about spending the day in a museum, I’d rather just aimlessly wander down London’s quaint streets and see where they lead me. So while hubby had to work in the local office, I was free to explore the city. Sorry honey! 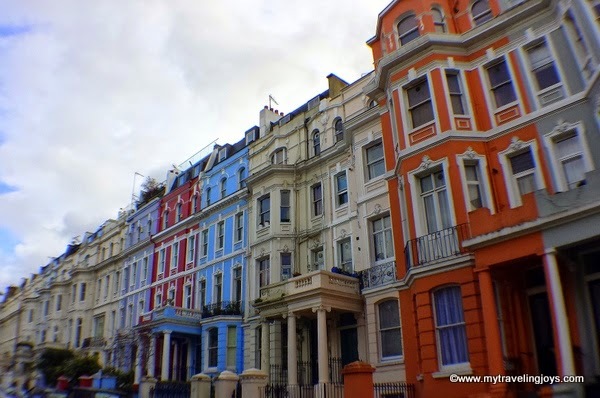 On a rare partly-sunny day, I decided to head toward Notting Hill because I remember enjoying my day there four years ago. 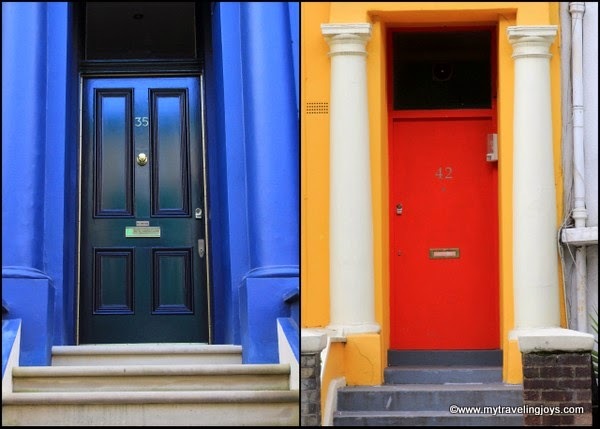 This time, I tried to explore the side streets off the infamous Portobello Road. I’m glad I did because I quickly became distracted by all the beautiful colored row homes I found! Different shades of rainbows and muted pastel colors filled many of the streets of this now posh neighborhood. 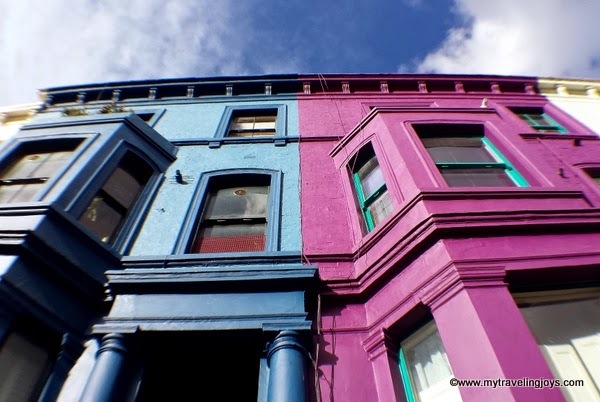 These colorful beauties are located along Lancaster Road in Notting Hill. It's almost like each home owner tried to outdo his/her neighbor! 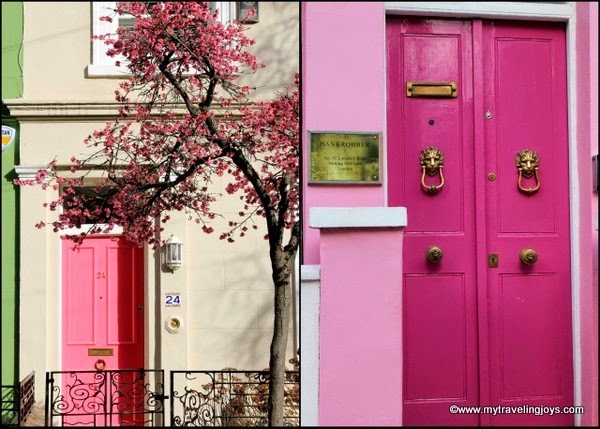 One of these stunning row houses can be yours for the bargain price of £3 to £10 million ($4.5 to $15 million). Cough, cough! I knew London was one of the most expensive cities in the world, but really? Even though these were the same color, they look pretty. I love the arched windows! Well, if you don’t have a couple million in the bank, you can do what I did. Grab your camera and see where the lens takes you. It’s easy to while away a few hours, stopping now and then for a coffee or glass of wine at one of the many cafés in Notting Hill too. 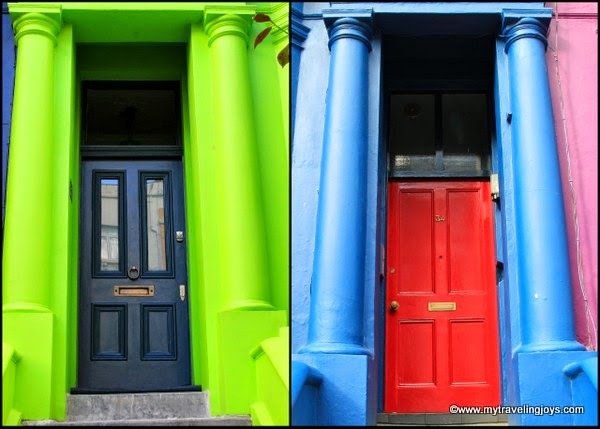 Which colored row house would you want to live in? 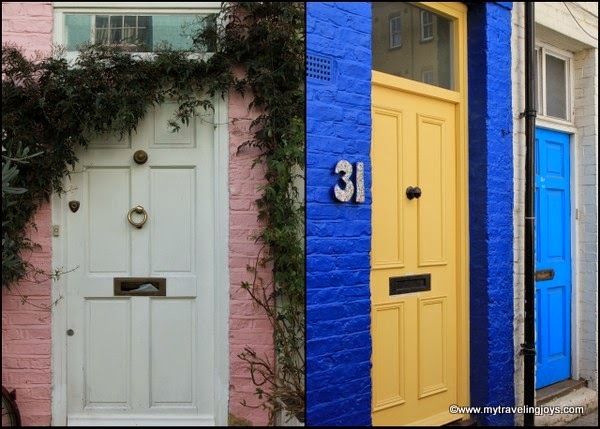 These blue doors decorate one of the so-called British "mews houses," which are a row of former stables that usually had carriage houses below and living quarters above and were built around a paved yard or street. These were popular in London during the 17th and 18th centuries. Today most mews stables have been converted into houses. 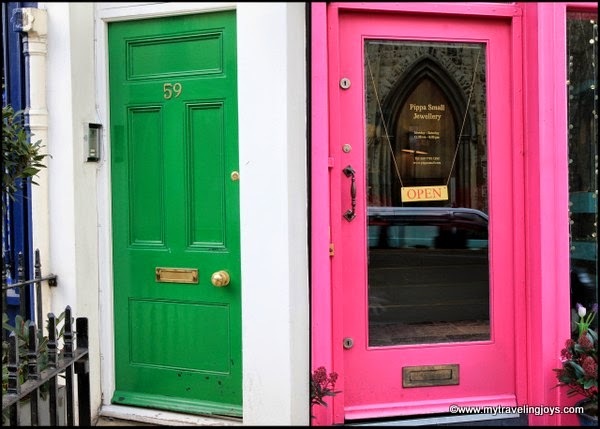 And I couldn't resist these colorful front doors too! New Yorkers should definitely take note! Does the pink door with the lion knockers (near the bottom) have a sign that says "Bank Robber???" Love all the colours. Shamefully (? 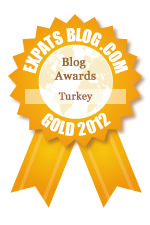 ), we know Istanbul and Ankara more than we know London. We're from the northwest of England and neither of us have been to London (apart from Wembley Stadium) since our very early teens. :) Will get to know it better one day. @Julia, Well I know I have traveled more around Europe now than I have of the U.S. At some point, we'll settle back down in our "home" base. No worries! Wow, how different it all looks. When I lived in Queen's Gate, all the houses were painted white! Colours remind me of Curacao.